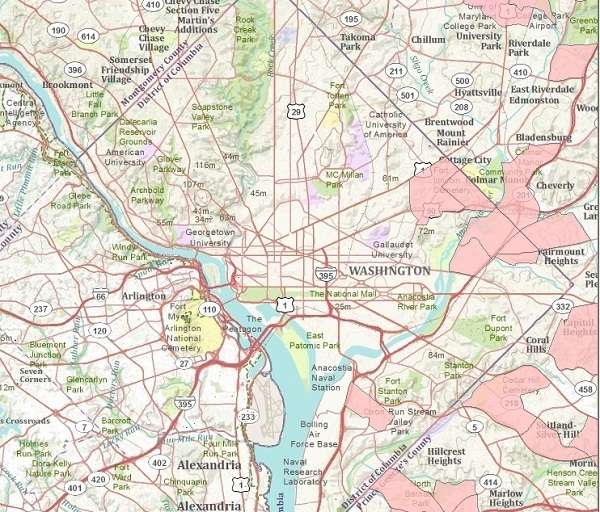 The U.S. Department of Agriculture released its online food desert locator this week, and a look at D.C. highlights some grim realities that we know all too well about. The data explores food deserts (low-income areas with poor access to grocery stores) by Census tracts, which are geographic areas. About 18,000 D.C. residents live in food deserts, where there are also high concentrations of children. In one such food desert, 39 percent of residents are children. And although Prince George’s County (D.C.’s Ward 9?) has more food deserts, D.C.’s deserts have higher concentrations of children. In fact, only two food desert Census tracts in all of Maryland and Virginia have higher concentrations of children than any of D.C.’s food deserts: Norfolk, Va. and Anne Arundel, Md. The pink areas are food deserts. In D.C., they are all located in Wards 5, 7 and 8. But this map doesn’t tell the full story, as food is just one piece in the health puzzle. Kavitha Cardoza explained to my fellow DCentric blogger Anna John that the District also has exercise deserts. Violence and the perception of violence creates environments in which children and adults are less likely to go outside, walk, bike and generally be active.